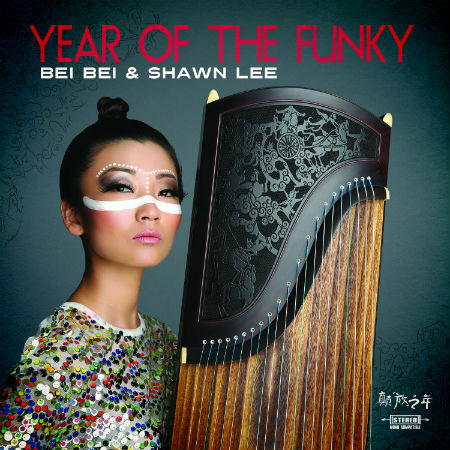 “Year Of The Funky” is the second album from Bei Bei & Shawn Lee. After their debut collaborative album “Into The Wind” released on Ubiquity Records in 2010, the Chinese guzheng virtuoso / composer and the prolific multi-instrumentalist / producer join forces again on 12 new tracks. “Year Of The Funky” marries a unique blend of ancient tradition with studio trickery. Eschewing all notions of superficial Asian/Fusion, this uplifting, genre-bending, and sophisticated sound brings together both East & West with musical aplomb. The new album continues as a logical progression from “Into The Wind”, while venturing into both new tempos & moods as it deftly connects the past, the future and what lies beyond. From the irresistible break of titletrack “Year Of The Funky”, which anticipated the album alongside a new video, to the hypnotic groove of “Kang Ding Love”, the relaxing atmospheres of “Soft Dream” or the uptempo rhythms of “Danxia Disco”, this album truly defies categorization. If this season of releases in 2017 is anything to go by, it will be indeed be the “Year Of The Funky”!